Before they completely fade, I like to do a review of my tulips. This year I have had several I have not grown before. All of them are grown in pots except for my favourite dark purple Paul Scheerer which I plant every year in a bed where Allium ‘Purple Sensation’ has let rip. A good challenge to Paul Scheerer for my admiration has been Black Hero,a double which has flowered late and long and was almost as dark. I combined this in a pot with lovely pink Angelique, but this was only quite successful as Black Hero was much taller than Angelique. 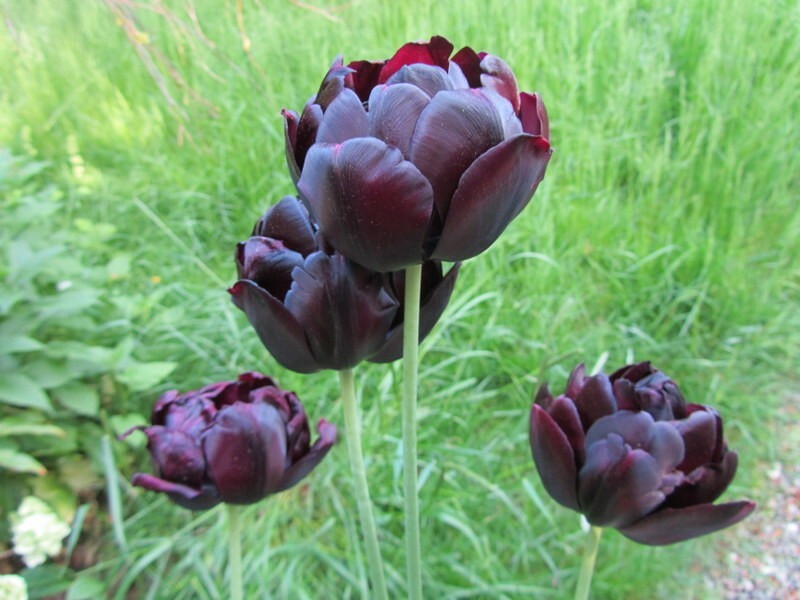 A far better companion for Angelique was Black Parrot which I have used in previous years, and they flowered in perfect unison at the same height. 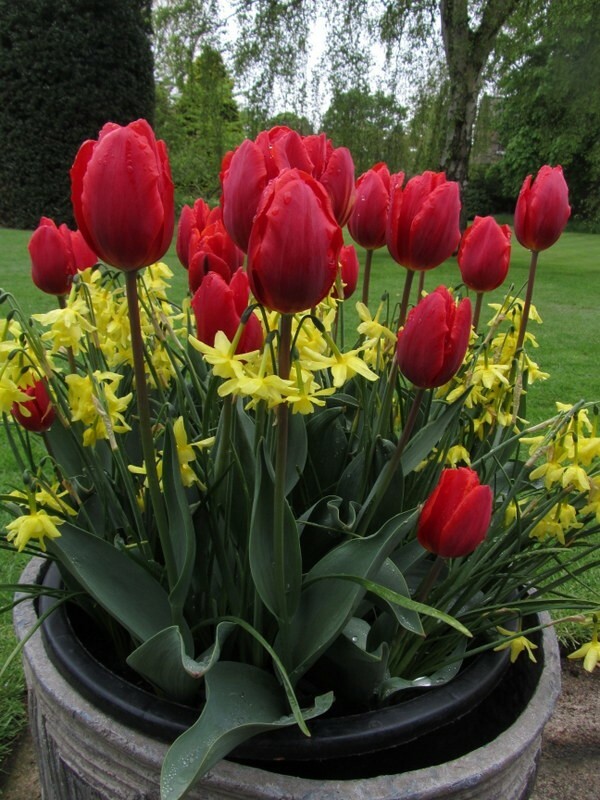 For my rather windy patio I hit upon a very good combination of Narcissus ‘Hawera’ and Tulip ‘Couleur Cardinal’. Bright yellow and bright red make an unsubtle combination but they both performed very well and are both excellent plants. They do not grow too tall and don’t need any kind of support. I might do this again next year. 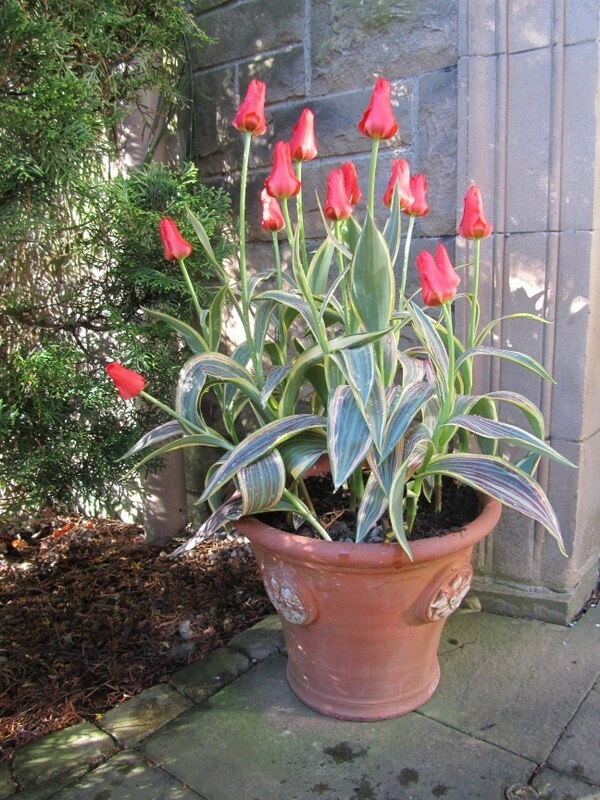 Pots of National Velvet (dark maroon) and Purple Dream, each grown on their own, were both excellent but perhaps more exciting were two variegated-leaved tulips. New Design, in spite of its dull name, is a subtle beauty. Pale green and almost white striped leaves precede the palest pink flowers. But perhaps packing more of a punch is one I had never heard of from Jacques Amand, Fire of Love. The leaves are full of drama from their early days, being striped yellow and green with dark markings and the scarlet flowers provide a vivid contrast. 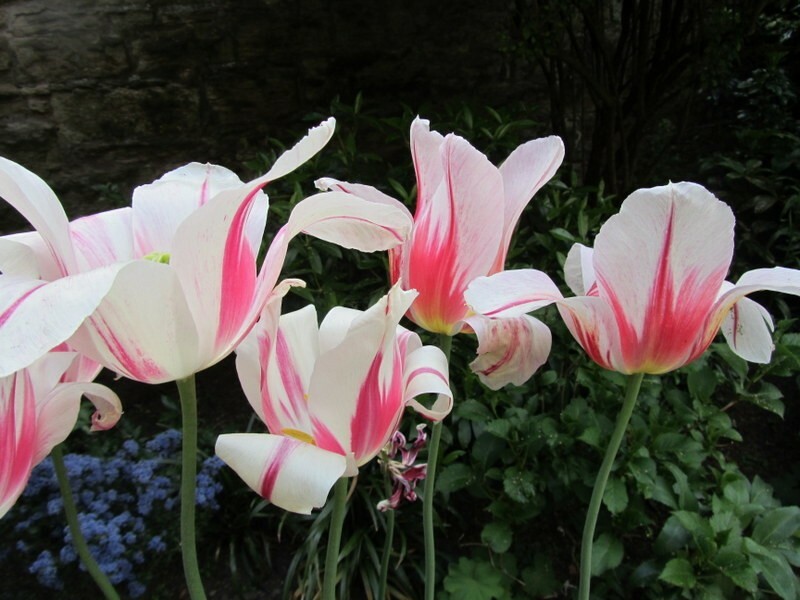 Exciting in a different way is Marilyn, quite beautifully striped red and white, and very tall. I first saw it in a stunning flower arrangement. To my surprise it has done well in a pot, stood up to the vagaries of Edinburgh weather, and is still presentable today, on 11th June.